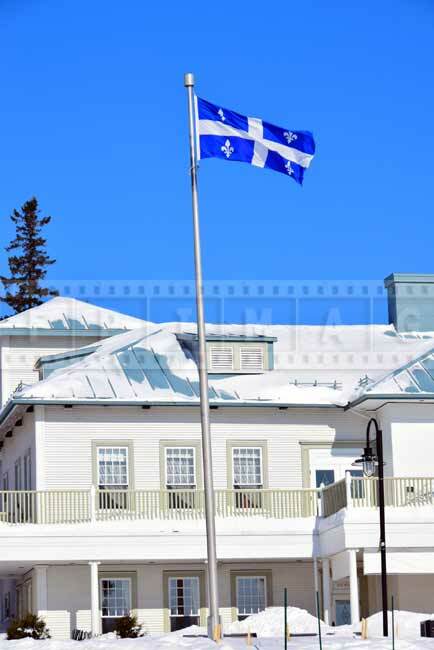 Park de la Chute Montmorency waterfall is a beautiful scenic park just minutes away from downtown Quebec, Canada. 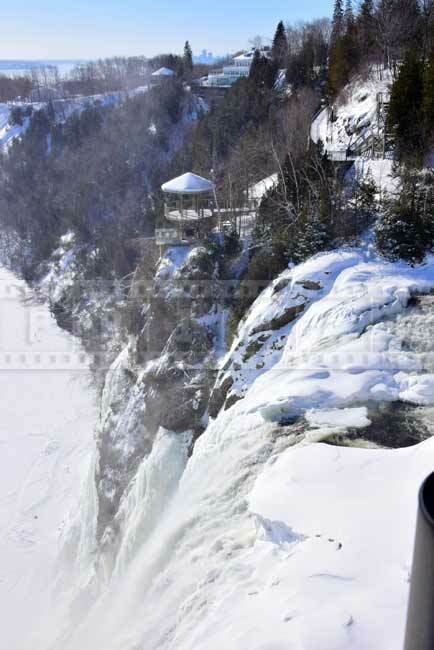 Montmorency waterfall can be seen from highway 440 if you drive north from Quebec. 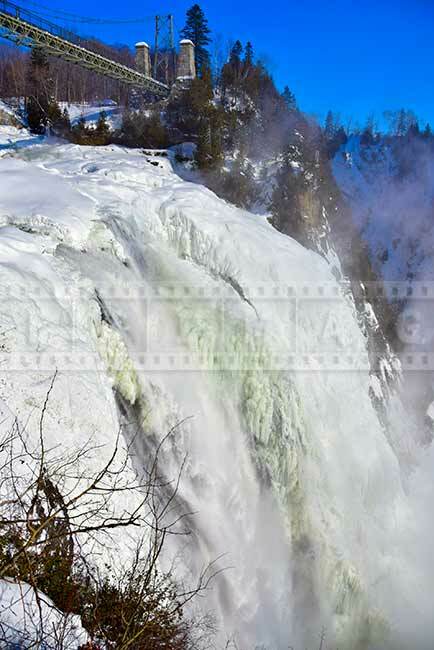 Park de la Chute Montmorency waterfall is a great hiking trail both in the summer and in the winter. 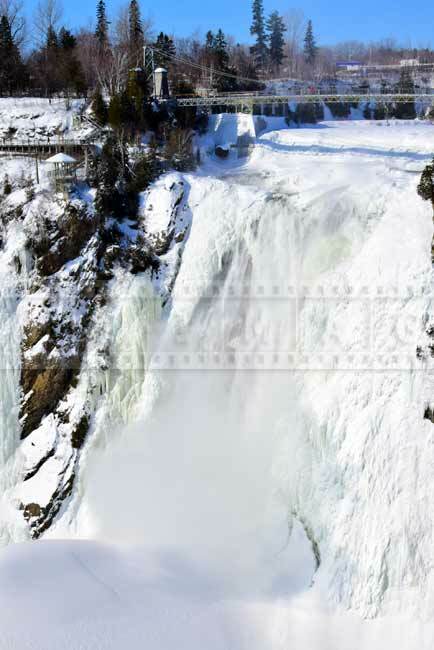 Montmorency waterfall is really dramatic in winter time. 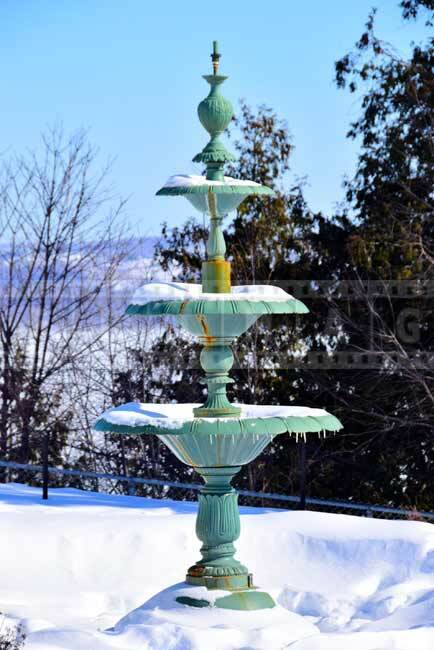 Water that rushes down freezes all around the fastest current and forms beautiful icicles and abstracts shapes and patterns. 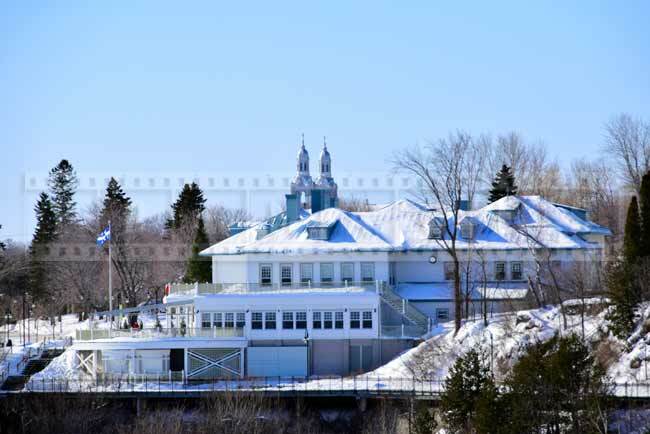 Park de la Chute Montmorency waterfall is opened year round and used to be a part of private estate. 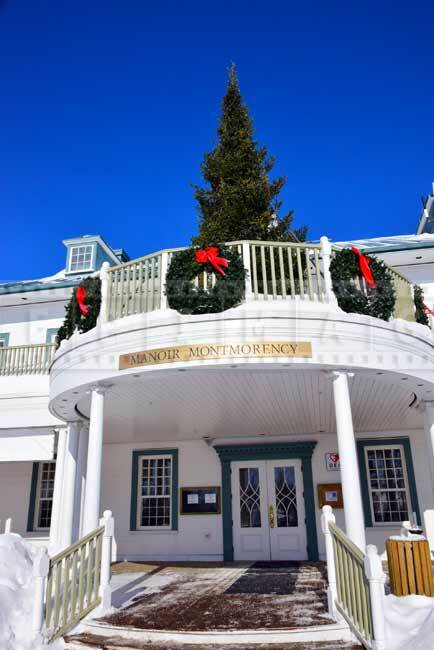 Large mansion Manoir Montmorency now serves as a museum and a restaurant. 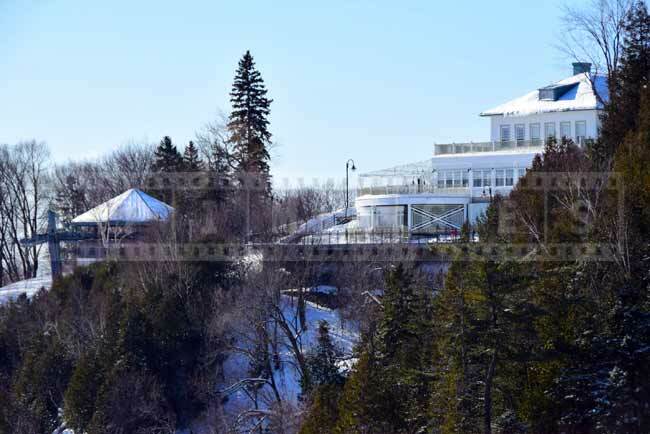 Montmorency waterfall has two parking lots. Use lower one if you would like to take a gondola ride to the top. 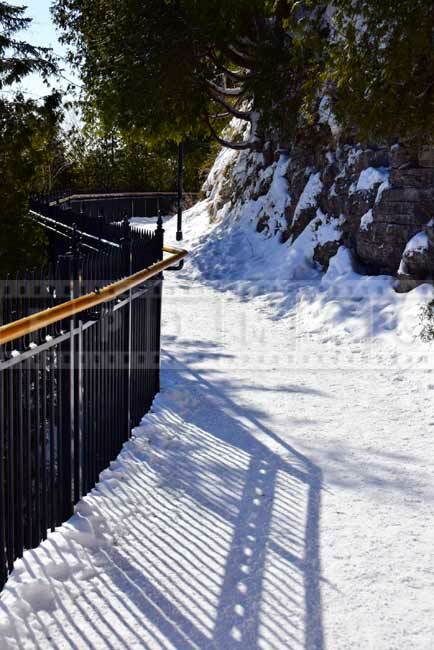 Lower part of Montmorency waterfall park also offers access to the winter hiking trail to the waterfall itself. This hiking trail is only accessible in winter when the water is frozen. 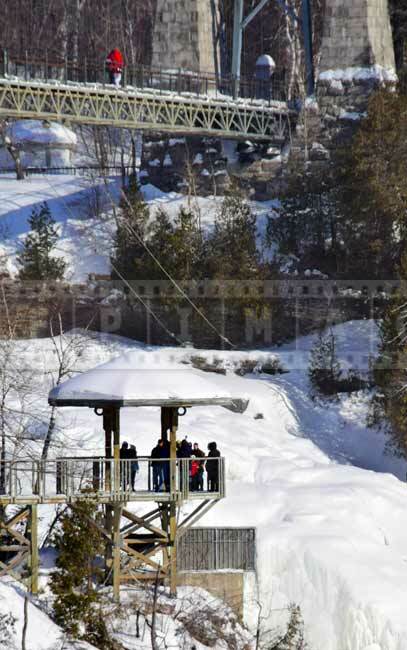 Park de la Chute Montmorency upper part has a nice suspension bridge on top of the waterfall. 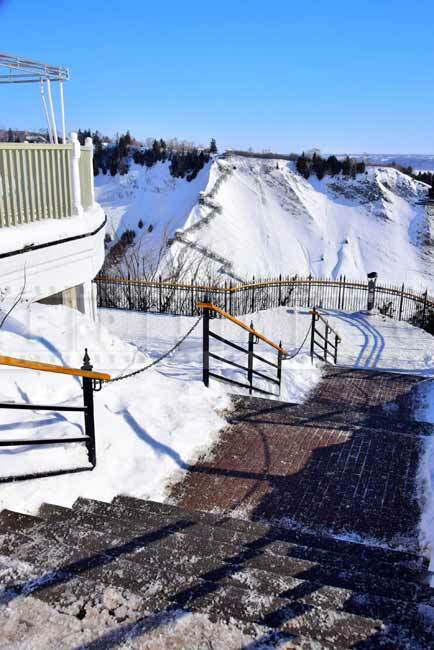 Nice walkway that starts near Montmorency Manor leads the way along the cliffs to the observation gazebo known as Baroness lookout and then via stairs to the suspension bridge. 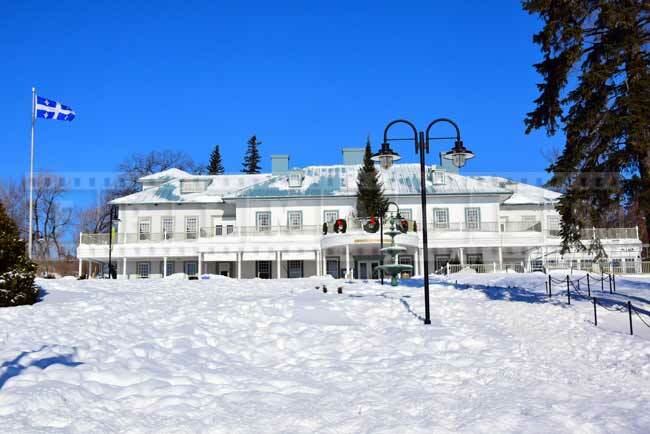 When you plan this day trip in winter time be prepared for cold temperatures and wind. 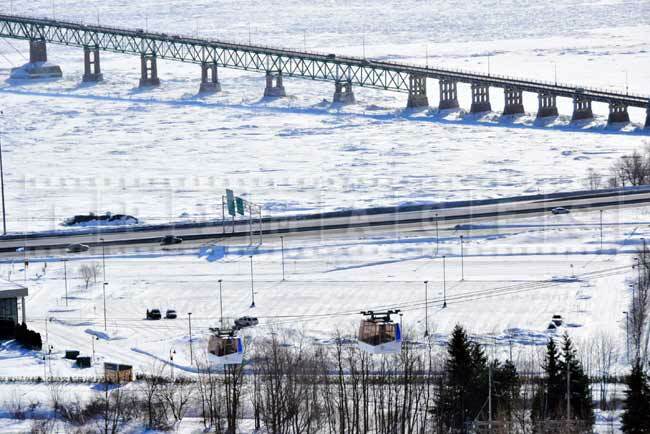 Conditions are fine near the building but once you get to the suspension bridge wind will get stronger and it will feel very cold. 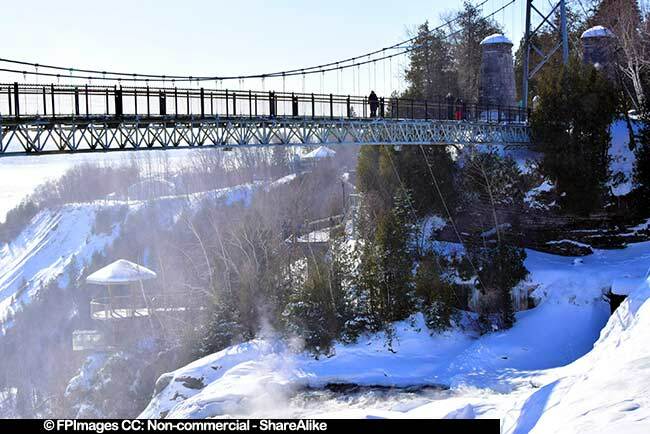 Montmorency falls park in Quebec has second bridge that crosses the fault and takes you to the battery trail and panoramic stairway. 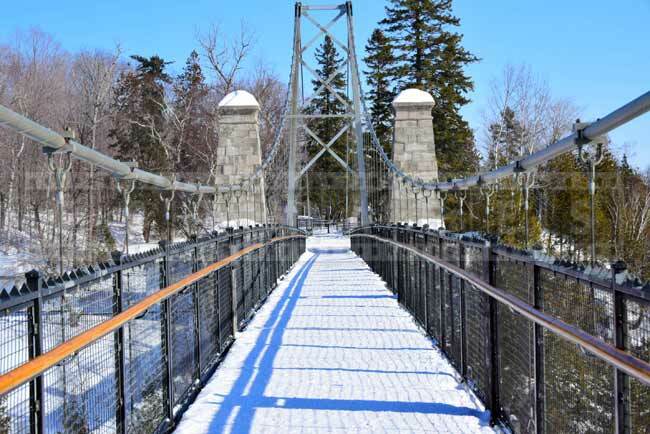 Battery trail and panoramic stairway (closed in winter) offer great scenic views of Montmorency waterfall and St. Lawrence river. 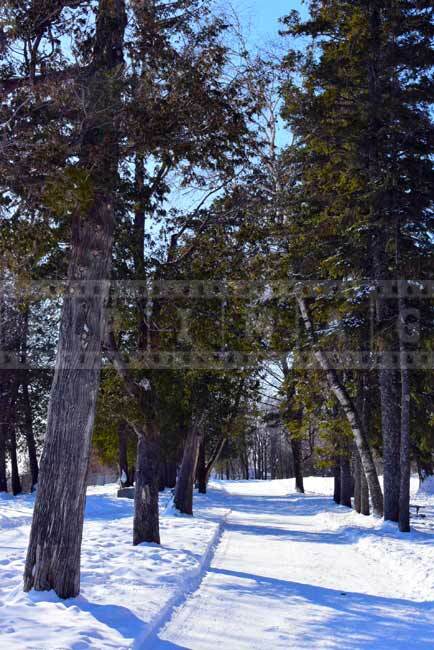 This open space gets very windy so if you decide to venture out to this part of winter hiking trail, wear a pair of ski goggles to save your face from freezing. 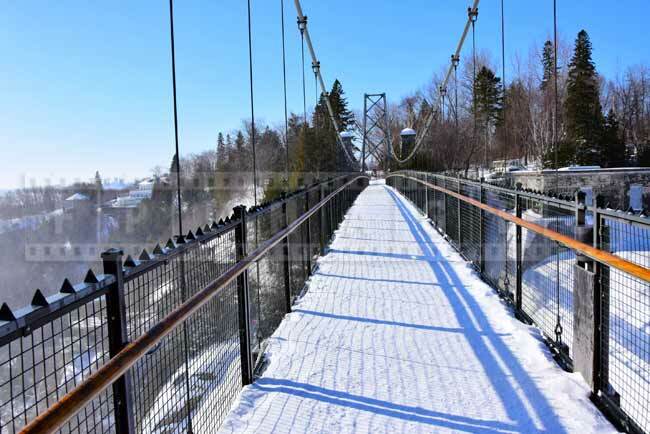 Wooded area between suspension bridge and fault bridge is excellent for snowshoeing or hiking. 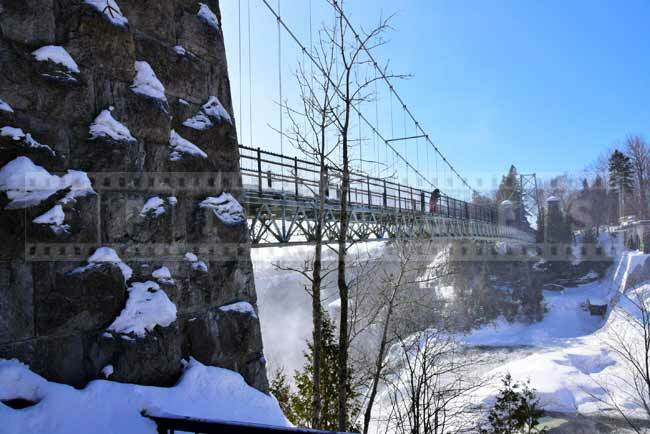 If you are looking for a budget travel idea or like outdoor winter activities, include a trip to Park de la Chute Montmorency in your list of things to do in Quebec city. 1. 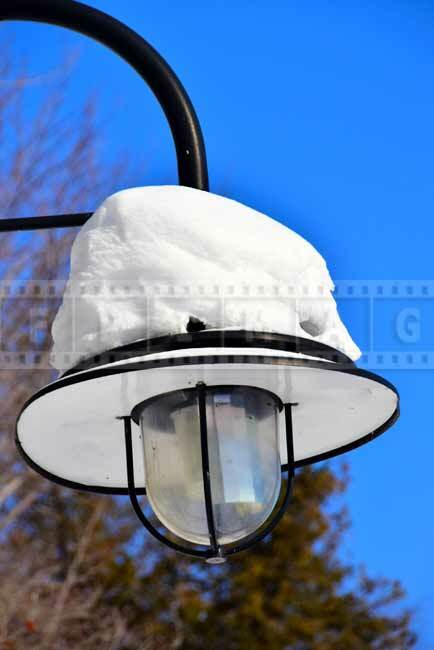 Make sure to charge your camera as cold reduces the battery charge. 3. If snowing use protective bag for the camera or use umbrella if winds permit. 4. Do not enter warm spaces after being outside with the camera due to condensation. 5. 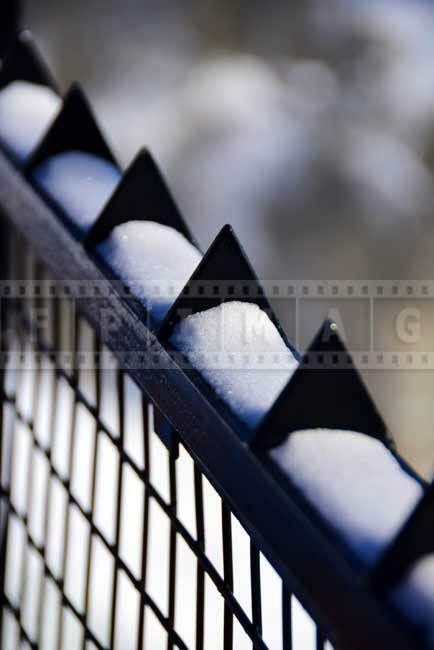 Think in advance about camera settings for current conditions. 6. 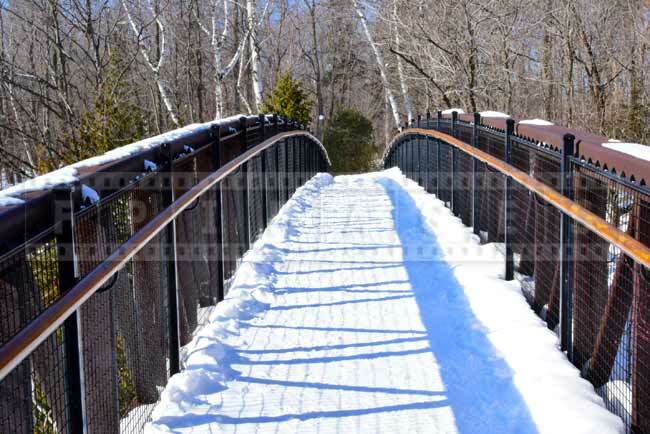 Exercise caution and common sense safety when walking or hiking in winter.